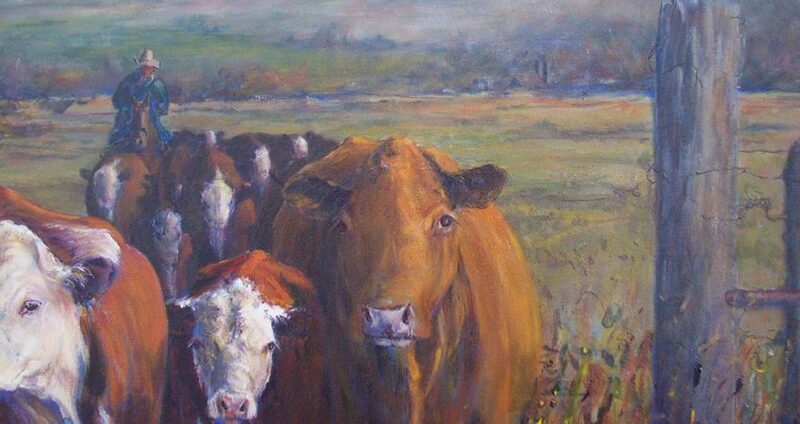 “It’s About Bovine and the Wood Butcher” with Shirl Akers and Vaughn Graber will open at the Lincoln Art Center on Friday March 29, 5:30-7:30, with a gallery talk at 6:30.. The exhibit runs through April 30. Akers has won numerous awards throughout her career. She works from her rural Topeka studio and often paints on location. Each autumn you can find her original art donated to KTWU to support PBS TV. She is retired from teaching art and donates her skills to various organizations. Graber graduated from Washburn University and has shown his work at Yeldarb in NOTO, Leaping Llamas, Creations of Hope and the Topeka woodcarvers show. In addition to woodturning he has also created numerous pieces of furniture. This exhibit is free and open to the public Tuesday-Friday Noon-4:00 and Saturday 9:00 am to Noon at the Lincoln Art Center, 126 E. Lincoln Ave., Lincoln, Kansas 67455. For more information call the art center at 785-524-3241. New Calligraphy Class - Script & Sip! Saturday Feb 13, 2018 6 p.,m. - Reserve your spot by Feb 2!